Pink is perhaps the most divisive of colors. Among the likes of Madame de Pompadour and Nicki Minaj, it inspires something close to obsession. In others, like Washington Post columnist Petula Dvorak, who implored participants in last year’s Women’s March to “back away from the pink,” it seems to inspire something more like revulsion. Lovers and haters alike, however, can probably agree that pink has power. Divided into two galleries, the exhibition starts by addressing the elephant in the room: why pink tends to be coded feminine. 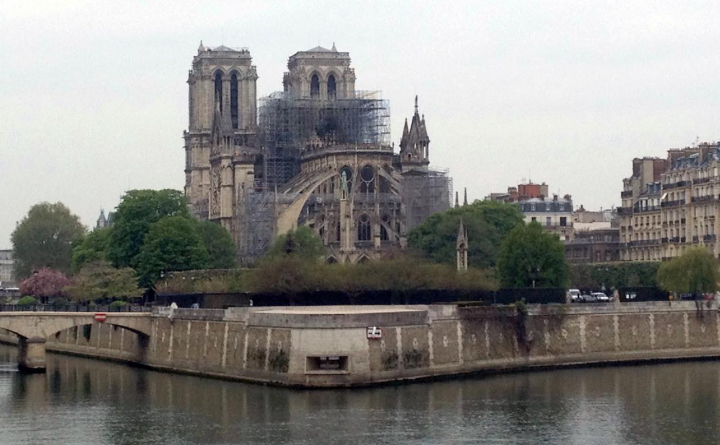 The answer is not as cut and dry as you might expect: as color historian Michel Pastoureau once wrote, “There is no transcultural truth to color perception. It is society that ‘makes’ color, defines it, gives it meaning”. Left to right: Robe à la française and stomacher, circa 1775; shoes, circa 1780; shoe buckles, 1770 – 1790. Man’s coat and breeches, circa 1785; waistcoat, 1770-1790; shoe buckles, mid- to late-18th century. Lent by Los Angeles County Museum of Art. 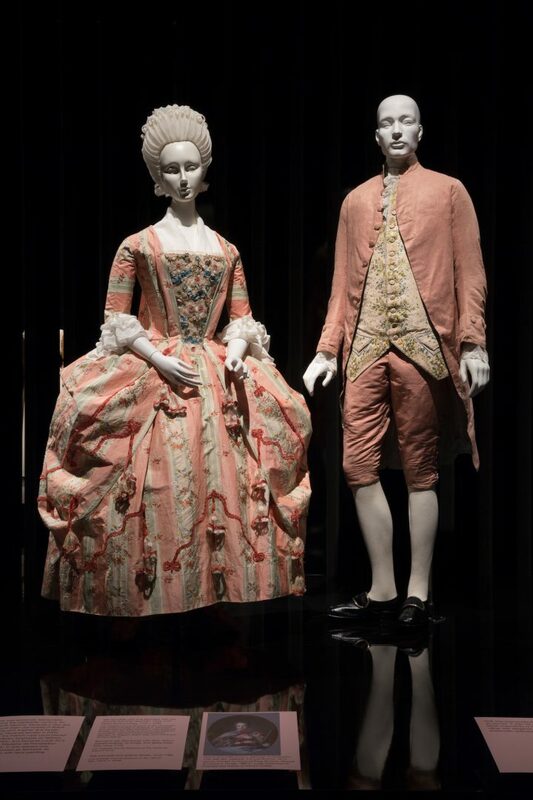 Pink, it turns out, was not always a “girl color.” In one of the exhibition’s remarkable displays are four historical costumes from the court of Louis XV, including a woman’s robe and three men’s outfits. Representing the theme of “Pompadour Pink,” after the pink-loving Madame de Pompadour, Louis XV’s official chief mistress, they date to 18th-century France, when the color was extremely fashionable among both men and women of the aristocracy. Thus the story of pink in Europe begins as a genderless color, associated with ideas of “elegance, novelty, and aristocratic splendor.” That started to change in the late-19th century Industrial Era, when men shifted to primarily donning black or other dark colors; women continued to wear the rainbow. The next two themes in the exhibition reinforce non-gendered, symbolic values of pink. An anecdote presented in one of the labels in “Pink versus Blue” describes how an American mother shopping for her son at Saks Fifth Avenue in 1920 would certainly have encountered divided opinions on the color. “Pink for the boy,” insists one sales clerk. “WHAT! Pink for a boy?” demands another. 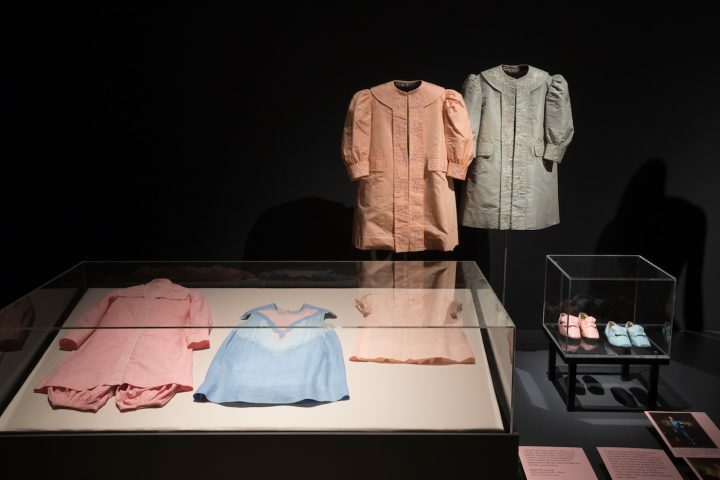 In this section, a group of pink and blue children’s clothes illustrate a great diversity of opinion in America during the 19th and early 20th centuries regarding which gender wears the pink color. Boy’s pink cotton smock, trousers, and dickie, 1899. 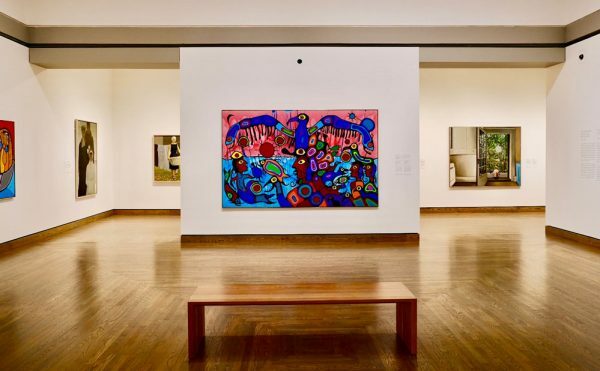 Lent by Philadelphia Museum of Art: Gift of Edna M. Fort, 1973. Girl’s blue linen dress with piecing and applique, 1930-1935. Lent by Philadelphia Museum of Art: Gift of Dr. and Mrs. Evan H. Turner, 1978. This debate raged on until the Second World War, when pink was aggressively marketed as female by advocates of returning women to the domestic spheres. From then on, many shades of pink dominated women’s fashion, appearing each time with an intention to define or redefine womanhood. 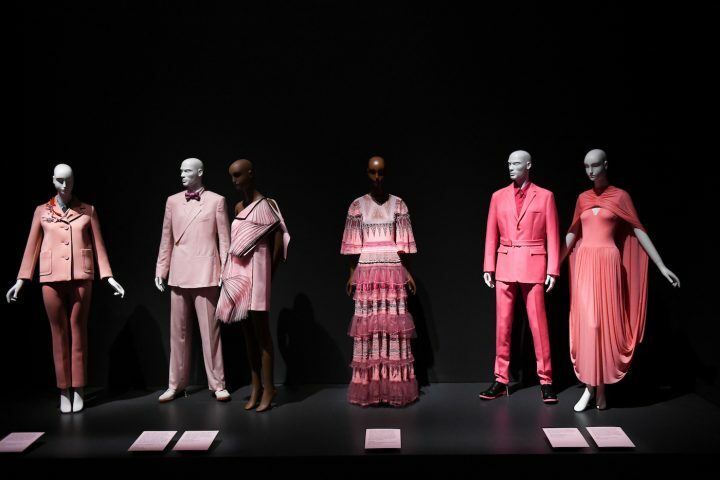 A series of “Shocking Pink” ensembles place the color in a global context, touching upon its uses and meanings for both genders in cultures such as Mexico, Africa, India, and Japan. Admittedly, as an art curator and historian, I felt disappointed with this section of the exhibition. Instead of seeing traditional pink garments from these cultures, on display are the inspired creations of Western designers drawing on these associations — such as a vintage Elsa Schiaparelli dinner jacket from 1947, and Lila Bath’s Mexican wedding dress from 1972. 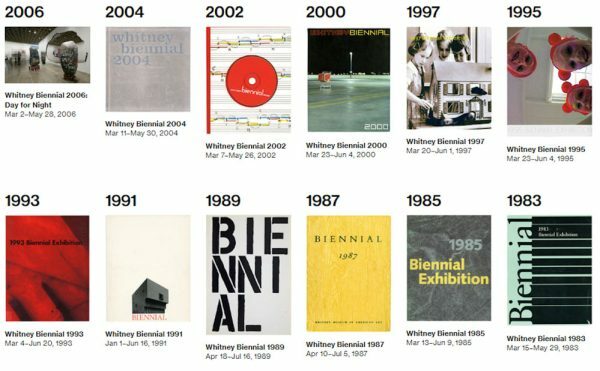 I felt the same disappointment with the reproduced images of paintings or photographs that are peppered throughout the exhibition’s labels in place of the actual artworks. Drape for me a traditional bright pink cape worn by Spanish bullfighters, and dazzle my eyes with the pink royal garb of an Indian prince. To argue, rightly, that fashion does not exist in a vacuum demands that context be present. The exhibition would shine the brighter for it. Left to right: Justo Algaba, cotton toreador cape, circa 2004. Lent by Hamish Bowles. Lila Bath, cotton and lace Mexican wedding dress, 1972. The Museum at FIT, Gift of Tanya Melendez. Esteban Cortazar, viscose, polyester, acetate, polyamide and elastane dress, 2018. Lent by Esteban Cortazar. The most sensational work of perhaps the entire exhibition is in the introductory gallery. 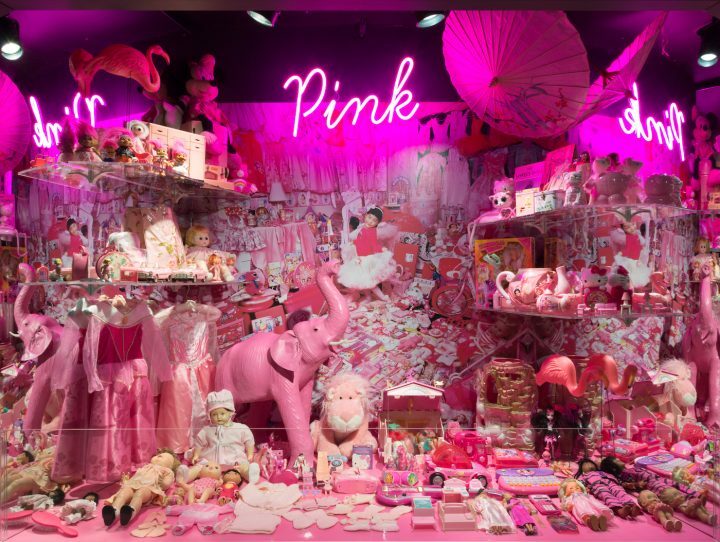 It is not a dress, but a diorama of pink girls’ toys. Serving as the diorama’s backdrop is a photograph by South Korean photographer JeongMee Yoon, Jeeyoo and Her Pink Things (2007). It is part of Yoon’s ongoing Pink and Blue Project series, which “explores the two colors’ influences in children’s lives”. Festooned and stacked in front of the photograph is a panoply of toys in a dizzying array of pinks. I cringed in recognition at some of the pink toys in the diorama that similarly lay in my daughter’s room. This installation shows the extent to which advertising, media, and pop culture subtly influence children and their parents. The remaining sections in the exhibition are rather uninspiring assembly-line displays of one pink dress after another. The linear organization proved especially challenging in the introductory gallery, which surveys chronologically the history of feminizing pink. However, truly distinctive pieces can emerge from the spatial monotony of an assembly line. And to experience the changes in fashion in a linear progression gave me an “ah-ha!” moment: from the height of pink’s feminization in the 1950s, designers and influencers since then have been attempting to return pink to its beginnings as a multivalent color. The idea is neither revolutionary nor innovative, but feeling so proves just how entrenched our gender-coding is. 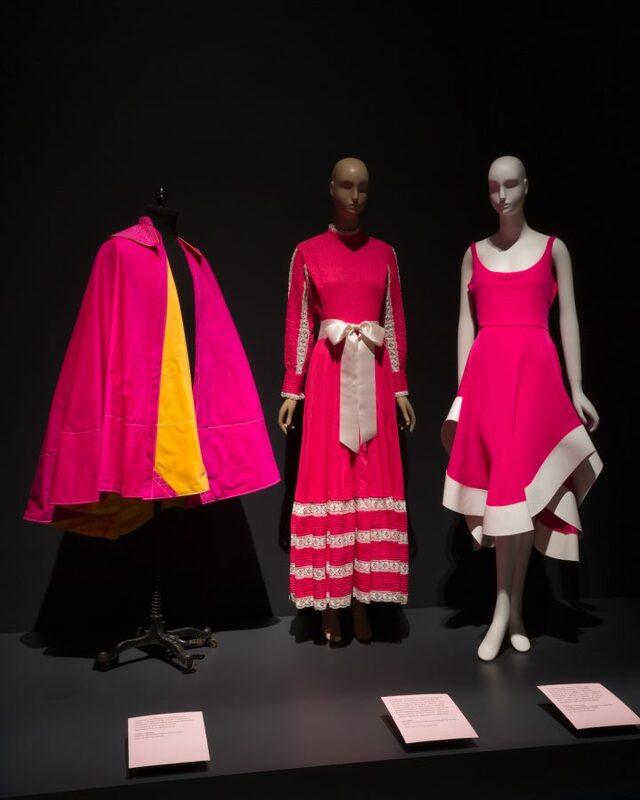 The question of why pink is so divisive followed me long after I left behind the exhibition’s Pepto-Bismol-hued haute couture. The current trend to return pink to its multifaceted, non-gendered origins gives me a glimmer of hope that today’s society is not resistant to change, and that whatever direction the shifting winds of fashion blow next, pink will remain a punk, pretty, and powerful color. Comme des Garçons, ensemble, Spring 2018, Japan, museum purchase. Exhibition view of Pink at The Museum at FIT. 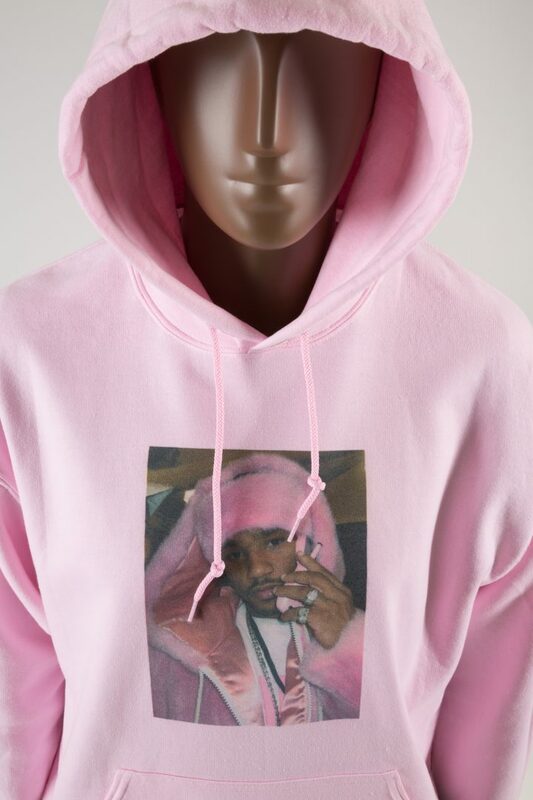 Sweatshirt, featuring photo of Cam’ron wearing pink fur, circa 2003, anonymous donor. Pink: The History of a Punk, Pretty, Powerful Color, curated by Valerie Steele, continues at the Museum at FIT (227 West 27th Street, Chelsea, Manhattan) through January 19, 2019.